The men-ü Daily Moisturising Conditioner is an ultra-concentrated formula that delivers up to 100 applications. Conditioning the hair without overloading, the nourishing formula helps to smoothen hair's texture while improving natural shine. Unlike men-ü shampoos, which are anionic (negatively charged), this conditioner is cationic, which means it is positively charged. As opposites attract, this means the optimum amount of conditioner is absorbed and retained without overloading. Any excess is washed away. men-ü shampoos and conditioners are a very powerful combination to recharge the hair. Expect silky-soft, recharged hair with improved resilience. Use 1.5 to 2 shots (depending on length and condition of hair) of this rinse out conditioner on wet, clean hair. Add more if required. Leave in hair for up to a minute before rinsing. Aqua, Cetearyl Alcohol, Cetearyl Stearate, Amodimethicone, Trideceth-12, Glycerin, Behentrimonium Chloride, Parfum, Butylphenyl Methylpropional, Hexyl Cinnamal, Limonene, Linalool, Phenoxyethanol, Isopropyl Alcohol, Cetrimonium Chloride, Panthenol, Benzophenone-4, Citric Acid, Sodium Hydroxide. 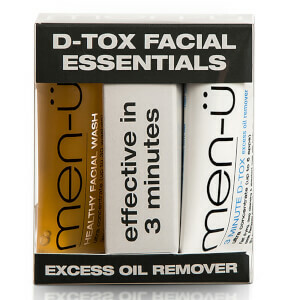 Save up to 50% + Free men-ü D-Tox Facial Essentials (15ml) when you buy 2 products. Free gift applied automatically - no discount code needed. Offer valid whilst stock lasts.